Regaining control of a MySQL installation is not all that difficult. Trouble is, there are a lot of tutorials out there showing intermediate users how to reset their mysql root password. For total noobs like me, it’s not that we can’t remember our password, it’s just that mysql has a habit of getting installed with password=NO. In other words no password, therefore no root access. Gaining access can quickly turn into a wild goose chase as you hunt down processes while risking your installation. If time is a factor, it can be days before you figure out the problem. No fear, after battling with a variety of incomplete and badly written “guides”, strange advice and the cult of msql administration. I found a guide that works with my current mysql setup on Ubuntu Karmic. Thanks to the accurate and faithful nixCraft for being there for us. I am reproducing the information below (which is under old school copyright) because without it I would be like stuffed. Hope nobody minds. It is common knowledge according to MySQL but laid out in a much clearer fashion. So if you reading this, take the time to check out nixCraft. Its a wonderful site. Here are the steps you need to take. In all likelihood you need to run them as root. Do we need to tell you that? Not really, you knew that already didn’t you? Well Ubuntu Global Jam 2010 came and went. Since we took the bug out of Global Bug Jam, there now seems to be a move towards Free Culture jamming. 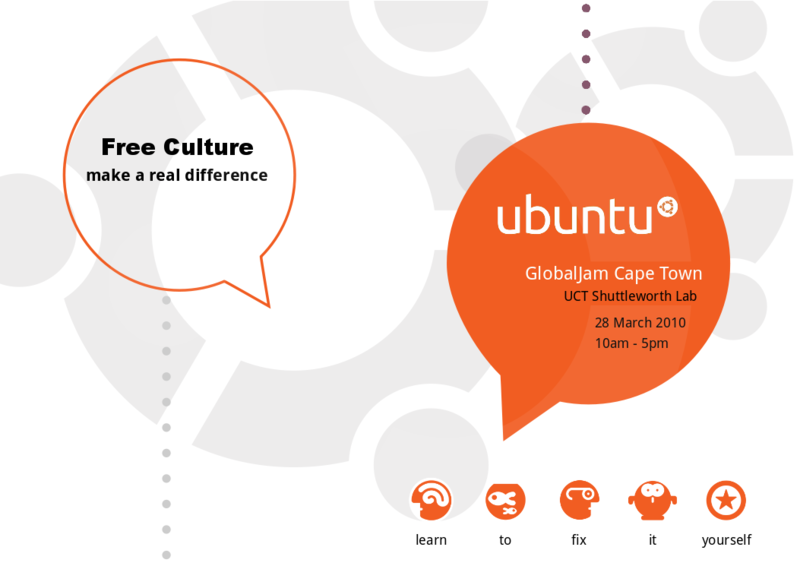 Yes I am rather proud to have gotten the words “Free Culture” on the Ubuntu-Za LoCo poster. With all the talk about the new music store it seems we also need to start including musicians and artists in the local mix. (Put the Love back into Ubuntu Global Love Jam!) Since my coding skills are rather rudimentary, I can only cheer people on in the pursuit of an ever more refined desktop experience. After a rather downbeat start to the event on Friday, Saturdy and Sunday, Okay, I did have video issues with the Jono Bacon linkup during the week on ustream, and IRC trouble with bugs in Empathy, Telepathy and Pidgin, I headed up to the Shuttleworth Lab at UCT. About 15 jammers were there and there was some kind of an informal programme/presentation. Guess I should have taken a bite of the opportunity to introduce the Ubuwiki and ZA-Free, but this is all year round stuff so no worries. But good news is ZA-FREE now has its own IRC channel on Freenode #za-free (we are not trying to get people to use linux, we are trying to get people to use freedom) and Ubuwiki, after a rather long hiatus, is going to losen up and follow soon. Michael Graaf and I are conspiring to produce some subversive flash-stick material. It was interesting just logging in with one of the terminals and realising my mail in Seattle was sitting on a server that could run the bots we need to keep our channels open. Good to meet up with Marcog in the real world, who helped me get out of the tricky ops situation on IRC friday night (with no xop, locked in a room, he came to my my rescue with the mode command). A big shout out to Stefano as usual, and Adrian for entertaining me with the great OGG vs FLAC debate. Not sure if we need a bake off, but its coming, and also to the Jammer who gave me the Dollar to verify my shell account on the Super Dimension Fortress before it gets erased — that was so intense dude. It was real. Enter the discussion on bots and building the next big thang – a personal robot avatar who can go to Global Jams for you. Video Face 2 Face and play the part of the fellow who discovers the bug while saving an airline ticket (along with the planet). This idea is a hot one. It is only a matter of time before we all start hiring out personal robots as extensions of our life on IRC datalinks and so on. Is this anything like the kind of artificial intelligence they promised us we would see in the 21st Century? Hell no, its your own intelligence amplified like i android will be by machines, modulated, and mediated through minds via computer information technology. Robot or Cyberborg still need to fight for their rights at Ubuntu Global Jam. Part human and part machine, the combination always freaks people out. Nothing new on that front, but just nice to see the essence being implemented in a computer lab. What else to report, I saw some very interesting consoles, and a few rocking user scripts, also some competition with Google Code Jammers. I can claim victory for getting one Human Bug to accept his bug status, and another kid updated on Dell Wing Tux which is a lot better than any old school Tux. Also where are the videolinks and people throwing Skypes? Not enough bandwidth is no excuse for building something that will work with no bandwidth. Finally, I would have thought a couple of CCMixter DJ jams would have been in order but we still a long way from breaking through the ivy walled garden of the Shuttleworth Lab. Keep those legal torrents flowing. I can’t verify that this will work anywere else in the world. It works for me with Pidgin 2.6.6, with a machine sitting in Cape Town, South Africa connected via MWEB. Download & Install the latest version of Pidgin. Open Pidgin and go to Add / Edit Account window of Pidgin. From the drop-down box choose XMPP as the Protocol. For the Screen name enter your Google Id (Gmail Id). eg. ubuntupunk (without any @ symbol or domain). Server will automatically populate with gmail. 1. Under accounts. Scroll down to your account. Check to see if actions are available. If they are not then there is something wrong. 3. Invite yourself to Gtalk to VOIP. 4. Log into you Gmail Account. 5. Check to see if the invite has arrived. Time for a Software Sources makeover? 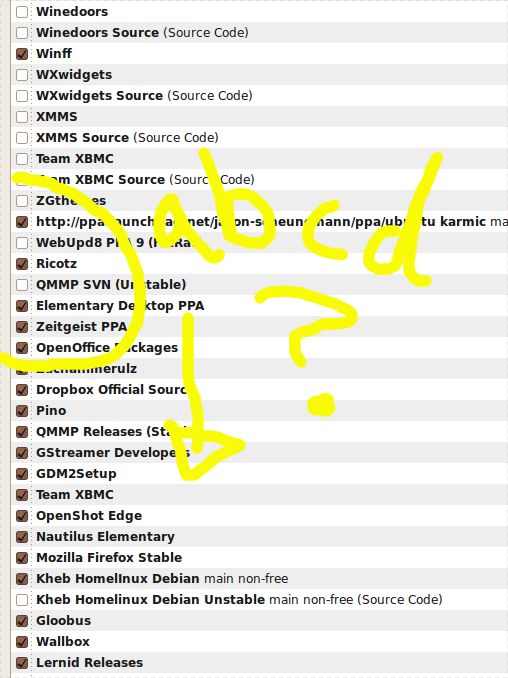 The reason why the list in Software Sources is only half-ordered is because my sources.list is alphabetized, while the ad-apted ppas are not. A simple request surely — Software Sources with a bit of the old ABC? Also, why do we have to manually #comment ppa sources? The basic information headings about a ppa should be automatically included whenever we add-apt. This might seem trivial, but when all this information gets into Software Sources, it can mean the difference between having an intelligent system and a dumb terminal. It should be relatively easy to see exactly where each package originates and who is maintaining what. Default filters do not supply the kind of information one needs on a growing system/ecosystem. A simple plugin to change the views in Software Sources would be an advance. In fact anthing which increased the functionality from a user perspective would be welcome. 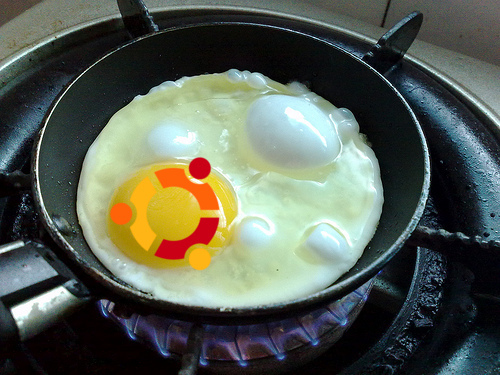 UPDATE: I just received news that as of today, 4-04-2010, Ubuntu One will have a Firebox Bookmarks synch facility. A step in the right direction. 1. In Firefox, in the Location bar, type about:config and press Enter. 2. Right-click anywhere in the grid, choose New, then String. 3. In the Enter the preference name prompt, type in network.protocol-handler.app.sop and press OK.
4. In the Enter string value prompt, type sopcast-player and press OK.
5. Try to open sop:// link on your favorite website and you will be presented with dialog box where you can search location of sopcast player. Navigate to ~/usr/bin and point to sopcast-player and click OK.
6. OK out of dialog box and now all sop:// links should open sopcast player automatically. Please note that parts 5 and 6 were written from memory so some of the wording might be incorrect but it should be pretty intuitive. Following on our popular Ubuntu Aubergine Recipe for this week’s coming Ubuntu Global Jam, we have installed the Gourmet Recipe Manager. Gourmet has a simple yet effective interface (it could also do with a recipe ppa section to stream recipes from your favourite chefs.) However, it can import web pages, just not automatically, and it is only a matter of time after installation until your database is populated with delictable recipes whose URLs are entered by hand. Yes, its time to share your secret recipes for slow food while creating foodbanks to feed the world!